Your young child is unique and probably has a wide range of interests and abilities. Help your child understand her uniqueness by showing her that you appreciate her as an individual. Young children learn about themselves when they explore their own interests and learn about other people. All of the offbeat characters in these books find ways to stay true to themselves. Your child will surely identify with one of them. 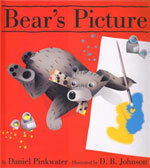 Bear's Picture, by Daniel Pinkwater. Illus. by D.B. Johnson. 2008. As Bear paints a picture, two proper gentlemen come along and tell him, “Bears can’t paint pictures!” Bear happily continues painting. Although the two gentlemen don’t understand his work, Bear doesn’t care. He knows it’s his picture, and he likes it just the way it is. A humorous reminder to believe in our own creative expressions. Naked Mole Rat Gets Dressed, by Mo Willems. 2009. Although all the other naked mole rats wear no clothing at all, Wilbur likes to dress up. His friends assume he must be breaking some kind of rule and complain to Grand-pah. But instead of outlawing clothing, Grand-pah decides to try on some himself. Although it takes them some time to get used to wearing clothes, the other mole rats soon see the pleasures of self expression through dressing up. 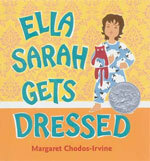 Ella Sarah Gets Dressed, by Margaret Chodos-Irvine. 2003. Ella puts on her pink polka-dot pants, her dress with orange and green flowers, her purple-and-blue-striped socks, her yellow shoes, and her red hat. "It’s too fancy,” her dad tells her. Her mom says it’s too dressy. Her sister tells her it’s too silly. Will Ella listen to her family, or stick with the outfit she likes? Talk about your child’s experiences. After reading these books, ask, “Has anyone ever said that what you are doing, making, or wearing is too different?” Listen as your child describes her experiences. Be sure to acknowledge the times when you criticized her individuality. Follow up by asking, “How did that make you feel?” “What did you do?” and "What could you do next time?" Dress up: Offer colorful hats, colorful adult-size shirts, and outlandish sunglasses. Observe and enjoy how your child incorporates the unusual items into his play. Art: Offer paper, crayons, glue, buttons, yarn, sequins, scraps of cloth, and other materials, so your child can make his own creations. Source: Adapted from S. Friedman, 2009, "Encourage a Strong Sense of Self," Now Read This!, Teaching Young Children 3 (1): 3.